This licensing system allows you to run the software on a campus or concurrent licensing scheme. You will need to install MLicServer on a computer that works as a server. This computer will need to have internet connection ‘at least every 90 days’, but we recommend that the server has permanent internet connection. For a campus license (say up to 150) you get a license server installed at your site and a license file common to all users. Every time a user installs the software and activates with that license file, the server will count one additional user, until it gets to 150, at which point it will allow no more users to activate the software. You have control of the server as administrator, so you can delete users without need to contact us, which means you can bring the count down by deleting users you know no longer use the software. Additionally, the server will automatically delete any users who do not validate by starting the software against the server at least once every 90 days (this is our default and it is designed to allow for holidays and trips, whilst still making sure licenses get released relatively quickly when personnel abandon the organization) – basically, once your users no longer have access to the license server, they disappear from the license server count. Of course, the beauty about this approach is that users can still use the software at home or when travelling. In the case of floating (concurrent) licenses, this works as follows: we give you a license server and license files exactly the same as before. An UNLIMITED number of users can activate the software, but only a given number can use it simultaneously. For example, imagine you bought 5 seats – you can have 400 people activated but, at any given time, only 5 can use the software. If an additional user tries to use the software at that time, he will receive a message informing him that the licenses are taken up and he will have to try to secure a licensed seat later. Bear in mind that in concurrent licenses, Mnova will only allocate licenses for the plugins users are using, as opposed to the plugins which are installed, so if one of your users is working only with a NMR spectrum, the floating licenses of Mnova NMRPredict Desktop and Mnova MSplugins will be available to other users, until such time as the user in question runs a prediction or loads a LC/GC/MS spectrum. Note that to be able to use these licenses, a connection to the license server is essential, so they are not indicated for working from home (unless a good VPN connection is available) or whilst on trips, but rather for working at the workplace. 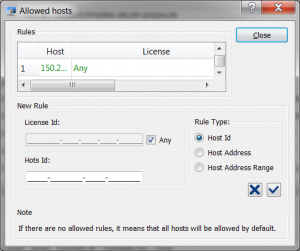 The MLicServer Graphical User Interface (MLicAdmin) consists of a main toolbar and three sections with information about ‘Server info’, ‘Sessions’ and ‘Licenses’. 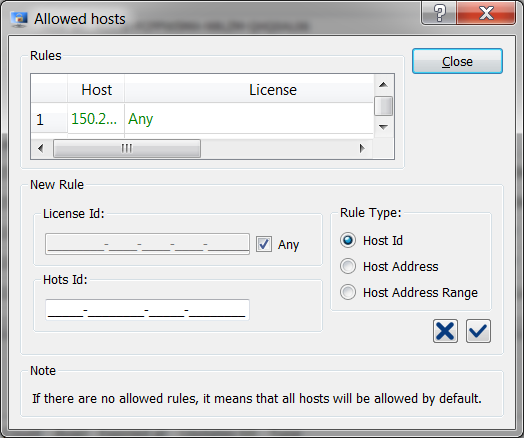 The ‘Edit reserving host rules’ button will give to any host priority in the use of a license (very useful for the concurrent licenses). 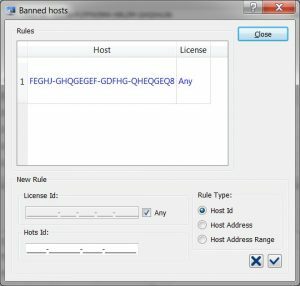 The ‘Managing allowed hosts rules’ button. 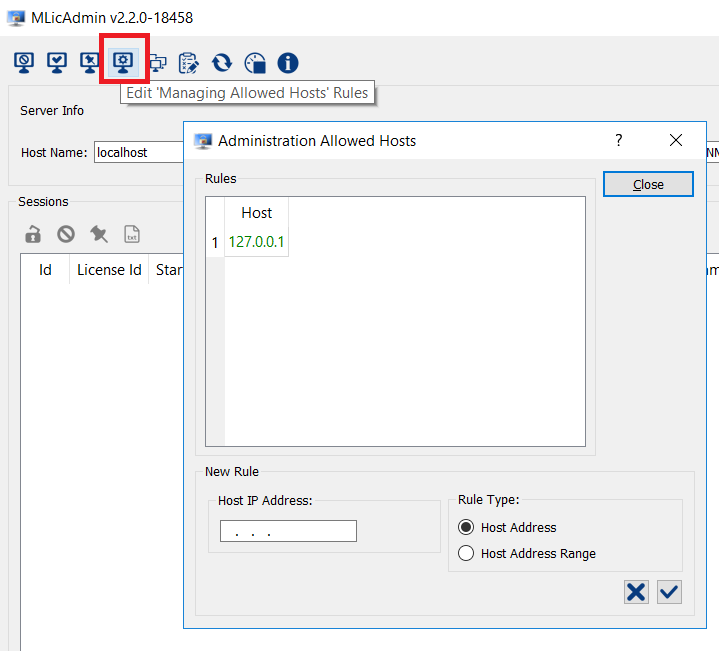 Be aware that the new MlicServer version 2.2.0, by default, only allows MLicAdmin connection to ‘localhost’. 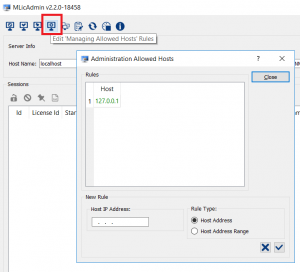 If you need to use MLicAdmin from any other machine than the local machine –where the server is running– then you must allow it from the MLicAdmin. So for the first time, the MLicAdmin must be run in the same computer where the server is running and the server name must be ‘localhost’ or the IP address ‘127.0.0.1’. This button will be used to ‘Manage group licenses’. Imagine that you have a site license for 100 users but 30 seats belong to one group and the remaining 70 to the other one. 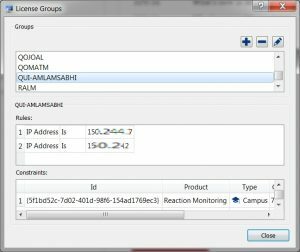 With this feature you can create several groups and add constraints to each one according to the desired license scenario. 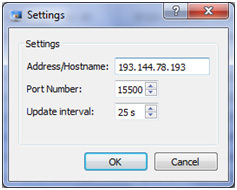 The ‘Edit server settings’ button can be used to change the IP address or hostname of the server, the TCP port number (it must be 15500) and the Update Interval. You can even stop the refreshing just by clicking on the applicable button on the toolbar. The last button can be used as a toggle to show/hide the server information (Host Name and HOST ID). The ‘Edit release policy’ button (hidden by default) will be used in the case of concurrent licenses to select the session timeouts (Minimum value = 30 minutes). If you check the box ‘2 minutes warning’, users will get a warning message advising them that their session will be closed in 2 minutes. The session timeout is the idle period, i.e., period for which the software has not been used by a user who has secured a concurrent or floating license, after which that license will be released. Generate a text file with all the current sessions information. This text file can be for example imported into any spreadsheet for statistical analysis. 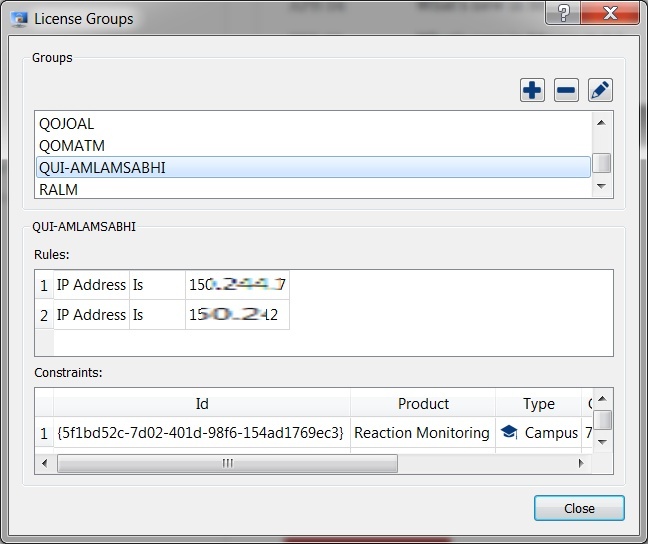 The ‘Licenses’ section includes information about the Id of the license, the product (Mnova, NMRPredict Desktop, Mass, Verification, Database…), the total number of licenses activated so far (‘Count’), the number of the available licenses (‘Avail’), the license expiration date, the update & support expiration date and the modality of the license (campus or concurrent). You can also export this information to a text file just by clicking on the applicable button. Can I have a multiple user license accross different operating systems?